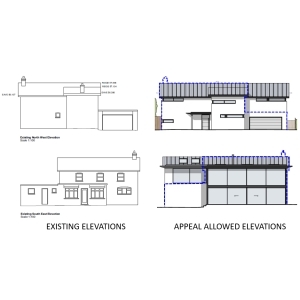 Christchurch Borough Council: Darryl Howells has successfully won a householder appeal for alterations and additions to the existing property, including extensions and remodelling the facades. The proposed plans were prepared David James Architects & Partners Limited and sought to extend and modernise the layout and appearance of the dwelling. The proposed extensions included a large double height lounge area, additional bedrooms and create an activity frontage. Christchurch Borough Council had refused the scheme on the grounds of harm to the established character and appearance of the area and neighbouring amenities. The client sought to appeal the decision, and instructed Pure Town Planning to prepare the statement and handle the appeal. In Darryl’s submission, he persuaded the Inspector that the resultant design would be well balanced and positive to the street scene although being notably different in design and setting; and that the bedroom windows will only cause oblique views of a neighbouring house that would not materially harm the occupiers’ amenities. The Inspector concluded that the scheme was a betterment to the existing dwelling and would wholly accord with adopted planning policies.